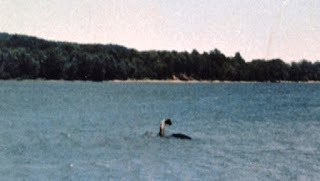 Ms. Mansi's photograph clearly shows what appears to be a plesiosaur or similar creature, rising from the surface of Lake Champlain. The neck, head, and what appears to be at least some of the torso, are clearly visible. In fact, the head is turned from the camera in such a way as to completely mimic how long-necked animals maneuver. So, they were discussing the photograph on TV the other day and one of these flat-earther "skeptics" said it was obvious that Ms. Mansi had taken a photograph of -- wait for it -- a log! Yes, a log! A flock of seabirds wouldn't work in this situation, but the infamous "swamp gas" does. See, sometimes gases form on old logs and submerged wood, causing it to rise to the surface and float for a while before slowly sinking back to the bottom. A very good, and incredibly implausible, explanation for all things "impossible." Except that the Mansi photograph very clearly shows grey-brown skin. If you look at the picture, the skin does not appear scaly and, though it might be rough, the water makes it appear slick -- much like a snake's or other lizard's. 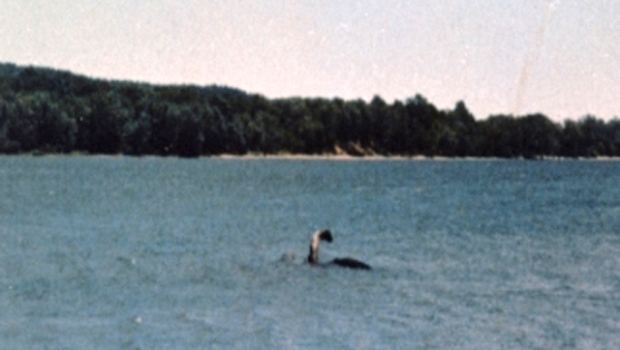 Further, the neck is crooked in a clearly visible way, with the head turned away from the camera. You can clearly see the outline of the head and all body parts are proportionate to the rest of the creature. Quite a feat for "swamp gas." I mean, after so many reported sightings, motion picture and photographic evidence, and historical accounts -- many from experienced seafarers and Lake Champlain residents -- how (why) can you explain them all away with such a flimsy, transparent, and obviously reaching "explanation?"